You may have some messages that carry particular importance. Of course, you keep them in a save folder inside Windows Live Mail, Windows Mail or Outlook Express and you have printed them, but one never knows. In Windows Live Mail, Windows Mail, and Outlook Express, you can not only back up all your email data easily, it is also particularly easy to make backup copies of individual messages. In Windows Mail, exporting to .eml files is just as easy. Open the folder containing the message you want to back up or copy in Windows Live Mail, Windows Mail or Outlook Express. Open the folder where you want to keep the backup copy in Windows Explorer. Highlight and grab the message with the mouse and drag it to the Explorer window while you keep the mouse pressed. If the Explorer window is hidden, drag the message to the Explorer window's taskbar icon and the folder will spring to the front. Drop the message onto its destination by releasing the mouse button. Good places for email backups are network locations, secondary hard disks, flash drives, media players, DVD-ROMs or other remote storage devices. This creates a copy of the message with the extension .eml. By default, Windows Live Mail, Windows Mail, and Outlook Express handle these files and you can open your back-up message copy by double-clicking it. If that does not work, try re-associating .eml files. 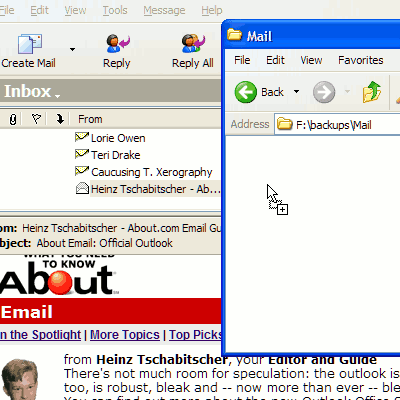 You can also import it to Windows Mail or Outlook Express (possibly on another computer) by grabbing it with the mouse and dropping it onto any folder in Windows Live Mail, Windows Mail or Outlook Express.